Candles are always pleasant and a must-have to light up your home or living space. 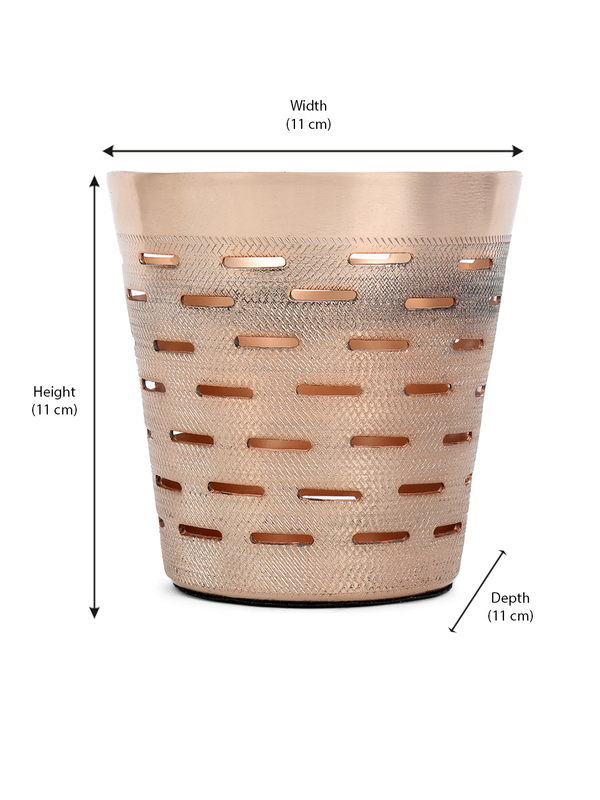 Presenting the Hercules Metal Tealight Holder (copper) which is guaranteed to split the warm rays of the candlelight and cast a glow on the walls. The holder is made out of copper and has a beautiful finish which makes it exquisite to look at and is also durable. It is in a beautiful floral design, with each holder standing out significantly. This holder is a testament of great craftsmanship and excellent quality. The holders sparkle and glow when the candle is lighted, giving a warm and romantic vibe. This candle holder's loveliness is unparalleled. It is a wonderful idea to gift this to your loved ones on a special occasion like festivals or birthdays or housewarming and other occasions. Anyone can buy this holder, but it is especially valuable for those who want to make their permanent living spaces a little brighter.It can even be used in dining rooms and halls for the decoration purposes and parties. It can be used as a unique gift too. The amazing thing about the product is that it shines like a diamond whenever a candle is burned inside.Brighten your room with this product from @Home.